SAN FRANCISCO THEATER CABS IS "SALE PENDING". PLEASE CHECK BACK LATER. 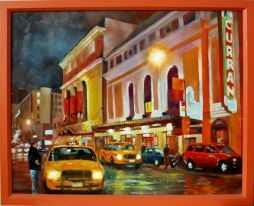 Original City Scape Art Oil Painting for sale by American Fine Artist Robert W. Moore depicting a San Francisco street scene of taxi cab drivers waiting for theater-goers.